Find the lowest prices for English Language Courses in Bournemouth! Are you looking for English language schools in Bournemouth or a English summer school in Bournemouth? 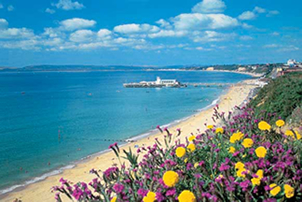 How about study English in Bournemouth or language courses for adults in Bournemouth? Whatever type of English course you are looking for, LanguageBookings.com will help you find it—and at the lowest possible price! Browse over many English schools in many locations in Bournemouth until you find the English course and school that is right for you. We make it easy to find discount prices at the most popular schools in Bournemouth and we provide detailed school information, photos, videos and students reviews for a great variety of English schools in Bournemouth. Choose LanguageBookings.com for all your courses reservations, and see why more and more students are choosing us to study English language in Bournemouth! English in Bournemouth is a good idea for serious students that really want to learn the correct speaking methods that the English language entails. You will not only be exposed to good English as you learn English in Bournemouth, you can learn all about the wonderful countryside that Bournemouth has to offer. A coastal resort and large town in England’s Dorset County, According to the ’01 Census the town is the largest Dorset settlement. It is also the largest settlement between Plymouth and Southamptom. Along with Christchurch and Poole, Bournemouth forms the conurbation of South East Dorset which has a population of approximately four hundred thousand. Currently, Bournemouth hosts many yearly festivals which English students can enjoy. This includes the annual ’05 Literary Festival. There is also a festival called Bourne Free which is about gay pride. This town was also a major Festival of Britain Center with ballet, opera and classic concerts in the year nineteen fifty-one. English in Bournemouth is especially important if you are interested in attending the Bournemouth University. This is the South of England’s largest universities and was formerly called Bournemouth Polytechnic in the years ’90 and ’92. One good reason to learn English in Bournemouth is that this University has its foundation in the former Dorset Higher Education Institute. It is one of England’s ex-polytechnics which perform better. The main academic campuses are in the nearby Poole. As you learn English in Bournemouth, you will soon find out that also officially at Poole is The Arts University Bournemouth College. This college specializes in performance degree courses, media degree courses, design degree courses and arts degree courses. Bournemouth is the England local authority minority which still upholds education that is selective including 2 grammar schools one for girls and one for boys. There are also eight comprehensive modern secondary schools. In town there is a small number of schools that are independent and a college for further education. No matter which campus you attend, you will need English courses in Bournemouth that are specifically for the academic setting. You can take English in Bournemouth a few months before attending Bournemouth University so that you won’t have a difficult time keeping up with the rest of your classmates. 100% guaranteed, that you will pay the lowest price for English courses in Bournemouth. We offer you the lowest possible course rates - you never pay more than if you booked directly with the school itself or anywhere else. Besides, our service is free. We do not charge any booking fees. It's very unlikely that something will go wrong with your booking once confirmed by the English language schools in Bournemouth. In fact we're so confident, that if you don't have your course place at the selected school, we'll credit your account with your full deposit AND find another possible alternative for you.